Keyboard shortcuts and modifiers - for many the approach adopted by Adobe for allocating keyboard shortcuts is too restrictive and often non-intuitive. If only Adobe had included a keyboard customisation feature similar to that in Photoshop, alas they didn't. So, until Adobe address this omission we must make do with what we have or do we? Let's begin with what every Lightroom user should already know. Adobe have included a fairly extensive list of keyboard shortcuts and modifier key combinations under the Help menu. Unfortunately, many of the more important shortcuts are less well documented. 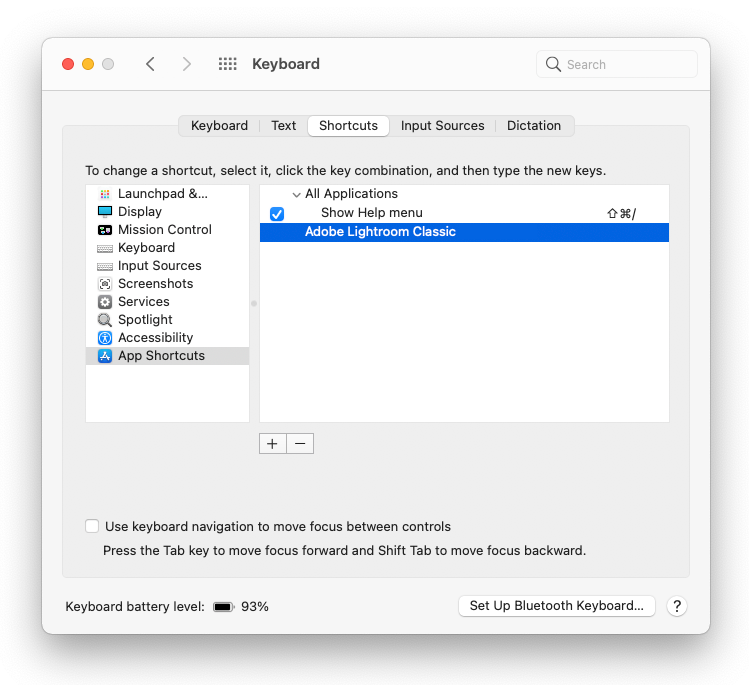 There's a bunch of undocumented keyboard shortcuts that may be shared by others writing about Lightroom is used for deleting a file or files from a Collection. Unfortunately, I think the manner in which it has been implemented leaves a lot of scope for unwittingly deleting (i.e. trashing) files. The keystroke combination required to delete files from a Collection is Ctrl+Shift+Alt+Backspace (Windows) or Cmd+Shift+Option+Backspace (Mac). This keystroke combination will pop the dialog shown in figure 1 below, that's assuming you haven't already switched on the "Don't show again" checkbox in which case the files will go straight to trash. So, be very careful when deciding how you're going to handle the checkbox. For what it's worth I think the iTunes Delete from Playlist (Option+Backspace) is a much more informative and useful dialog than that provided in Lightroom for what is essentially the same feature. If nothing else you're given the option of leaving the files on your hard disk or sending them direct to trash. Note the absence of the Don't show again checkbox. The new Adjustment Brush and Graduate Filter tools in Lightroom 2.0 have their own set of shortcuts and modifiers. Again, some are fairly obvious, others less so. Therefore, I have listed them below. The Ctrl (Windows) and Cmd (Mac) keyboard modifiers have an important role to play in many areas of Lightroom, not least the Filter Bar. The Filter Bar provides an 'AND' function between columns and filtering within a column is an 'OR' function. To enable this functionality you hold down Ctrl/Cmd key then make appropriate selections across or within columns. Using multiple keyword columns it is therefore possible for both 'AND' and 'OR' keyword filtering. The Filter Bar is also the location in which text based searches and attribute based filtering are carried out. The rule set for text based searches has changed little since Lightroom 1.x and they remain relatively self explanatory. However, it's worth mentioning a few of the less obvious filtering rules that come in handy for fine-tuned searches within the text entry field. For example, placing a '+' at the beginning of a word is the same as Starts With, placing a '+' at the the end of a word is the same as Ends With. Placing a '!' at the beginning of a word is the same as Doesn't Contain. Finally, multiple filters are activated by shift clicking the respective filter name (e.g. click Text then Shift+click Attribute followed by Shift+click Metadata). 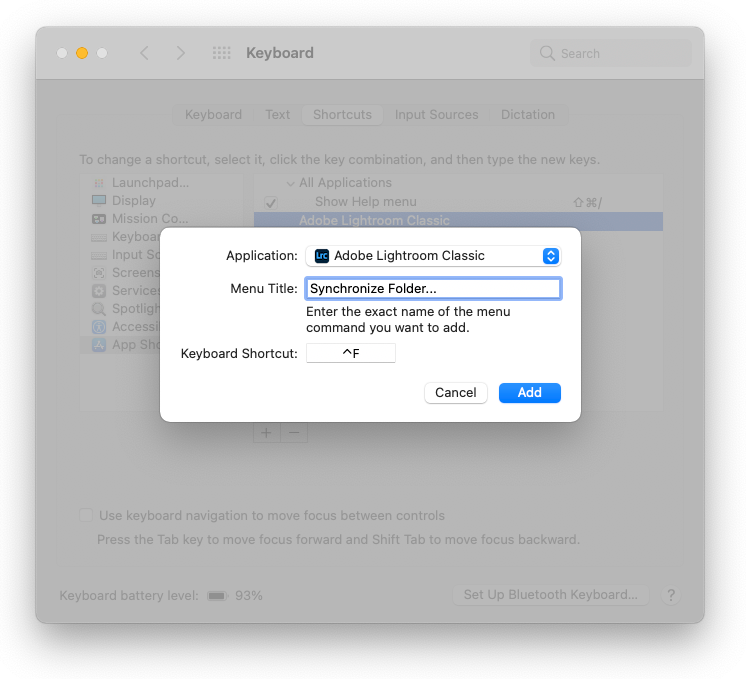 As I mentioned above Adobe have not yet provided a facility for customising Lightroom keyboard shortcuts, but that doesn't mean that it can't be done. For example, in both OS X 10.4 (Tiger) and 10.5 (Leopard) Apple have provided pretty much everything we need to create new shortcuts and/or remap those that already exist. Better still it can be done on an application by application basis. 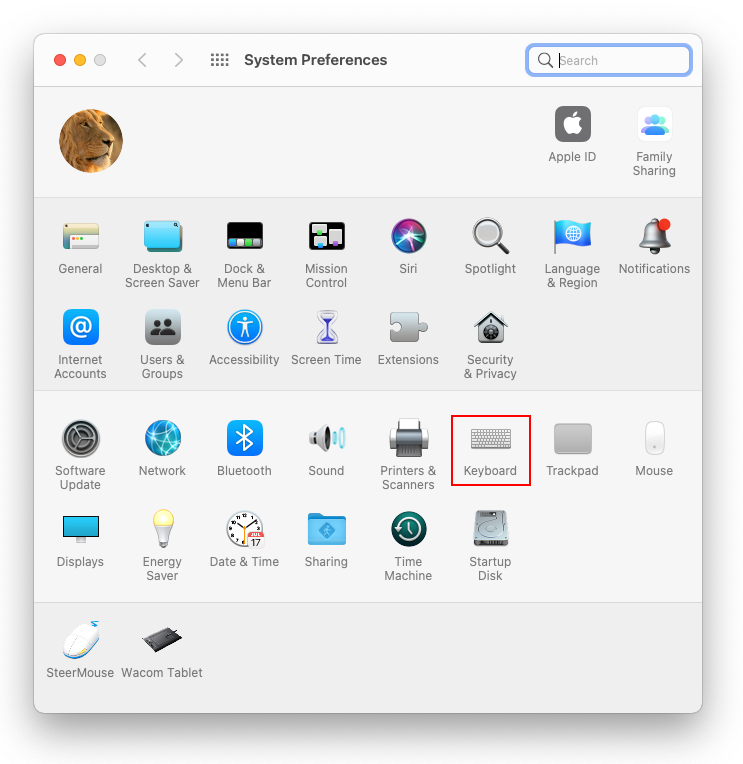 The tools required are located in Keyboard & Mouse applet of System Preferences pane (figure 4). Click on the + button to add Adobe Lightroom to the list of applications. When you press the + button you'll be given a list of applications to choose from. Tip: With the exception of toggling a few side panels Adobe have generally avoided the use of the Control (Ctrl) modifier in Lightroom, so you have this key at your disposal for any new shortcuts that you might want add. Likewise, the Ctrl key can be used if you want to free up an existing keyboard shortcut so that it can be used for one that's more important to you. The next step is were you will need to be careful because the information you type into the Menu Title field must be typed exactly as it appears in the Lightroom menu. As mentioned above, you can also free up an existing shortcut for use with a command you consider more important. For example, Show in Finder (Cmd+R), which is listed in the Library module Photo menu could be changed to say Ctrl+F, thus leaving Cmd+R for Read Metadata from file. Launch Lightroom and check that the new keyboard shortcut has been listed against the command. The steps followed up to this point will have freed up Cmd+R, which can now be remapped. I've been using the method outlined above to add new shortcuts since Lightroom 1.0. In most instances it works well, but occasionally a command will be ignored. If this does happen it's a simple matter of deleting the shortcut from the list and adding a revised version. That said, it is better to delete the command after having first closed Lightroom as not doing so will often end with the application crashing. There are aspects on the Windows API that are less flexible than their Apple counterparts. This is particularly true of remapping keyboard shortcuts and modifier keys. It's not hat it can't be done but rather it's not so easy and generally requires third party applications and or scripts. Fortunately, a number of Lightroom users have developed scripts that can be used to achieve broadly similar functionality to that described above for the Mac. One such user is Gordon McKinney, and his script can be found on the Adobe Lightroom User to User forum FAQ This script is specific to the Library and Develop modules, but who knows with some encouragement he might extend it to included the other modules. Tim Armes over at Photographers Toolbox has released a plug-in for Lightroom 3 that helps users remap their keyboard shortcuts. Unfortunately, it doesn't work with earlier versions of Lightroom.